For the highest effluent quality at the lowest power consumption on the market*, choose the Concrete+. The Biocell Domestic Concrete+ is one of the most popular domestic wastewater treatment plants at Biocell Water. This impressive home sewage treatment system combines a reinforced concrete septic tank with a three-stage treatment process into one single domestic packaged plant. 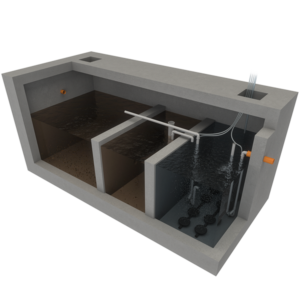 Unlike many other domestic septic systems on the market, our reinforced concrete tank is suitable for below ground or above ground installation in all soil conditions. It is also suitable for installation in areas with vehicle traffic or livestock due to the reliable and robust structure of the concrete tank. Like all Biocell home sewage treatment plants, the Concrete+ is both EN12566-3 and SR66 certified and British Water approved. The innovative design comprises a strong water tight tank made from reinforced concrete with a flat base for easy installation. 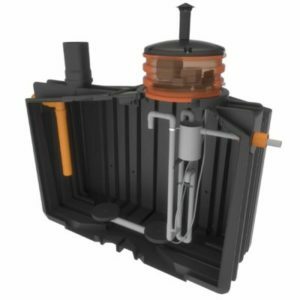 This shallow dig tank does not require a concrete backfill – saving time and money on costly installation works. 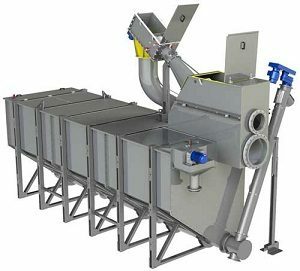 It boasts very high effluent quality in combination with low running costs and a huge sludge storage chamber for extra long desludging intervals. In addition to the standard model, there are gravity and pumped outlet models available. 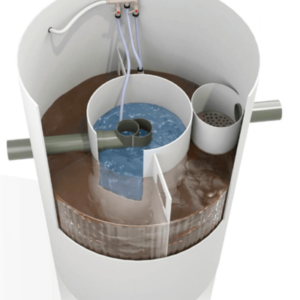 In situations where an existing domestic septic system is outdated or failing, the Biocell Domestic Concrete+ is approved for replacement installation. It is a plug and play unit, with all the necessary components for domestic sewage treatment inside the concrete tank. There are many reasons behind the success of the Biocell Domestic Concrete+. It is a strong, durable and reliable home sewage system with a great price tag. Homeowners benefit from low set up and running costs, whisper quiet and odour free operation and long intervals between de-sludging. For builders, installers and industry professionals we offer a trade discount. We like to make things as easy as possible by delivering and placing the tank inside the excavation with a truck mounted crane. Where there is a high water table, this tank is the easiest to install. After that, it is plug and play with all the components built inside the system. Our experienced technical sales team are here to help guide you through the process and ask the necessary questions. Simply get in touch using the contact form or give us a call. We are happy to provide you with a free quotation or to provide extra information about any of our wastewater treatment plants and products. We look forward to hearing from you. Gravity models: 110mm / 4"
Pumped models: 38mm / 1¼"
Our experience with Biocell was positive right from the start, they are very good at what they do! Good communication and reliable. Very helpful staff with great technical knowledge, made the process a lot easier for us. Went with concrete in the end. Very happy with the service. It was my installers first concrete tank and he was impressed. I am happy with the overall solution. Great purchase. Happy I went with concrete – but you do need plenty of space for the delivery truck! Didnt know you could get a concrete sewage treatment plant until I found this one. In the ground now in Scotland. No complaints! Received good advice from biocell. The price was very competitive. Wanted concrete but didn’t want to buy from the local guy as he is a one man band so no backup if he stops selling/retires/is on holidays. Went with Biocell and glad I did. Good product and they supplied manhole extensions for free. I work with concrete daily so wanted a concrete tank. Way better value than other systems I priced and very happy with it. Had to go concrete as pipes were so deep. Good service. Purchased for my new home in Ireland. Its one of the only tanks on the market that does 8 pe in a single nice round tank. Didnt want a two tank system as its extra connections and hassle. Very good job. A local concrete guy had a concrete tank on offer also – but I wanted to deal with a company that will still be there in 20 years! Installed in the middle of a field so went with concrete to be safe. Very big strong tank. Very impressed. A different system was recommended by my architect. Shopped around and bought a biocell concrete and saved a few pound. Architect was also happy when he saw the unit installed. Tight for space so installed tank under driveway. Good job. Great job. Dropped in the hole with the crane. Very big tank. Value for money. Was going to buy from a local concrete lad – but the local guy seems to make tanks, fence posts, paving slabs, etc, and was not very knowledgeable – so decided to go with a specialist supplier as want a good aftersales service.